From the first Earth-size planets beyond our solar system to a "UFO" that turned out to be a U.S. military drone, this week had its share of intriguing stories. See the stories that made our top list for the week and vote for your favorite here. Astronomers have discovered two potential alien planets that apparently survived being engulfed by their bloated, dying parent star. 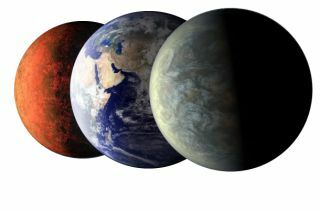 The discovery is a surprise to many scientists, as it had been widely believed that no planet could withstand such a thorough and intense scorching, researchers say. Also a surprise: The hardy alien worlds seem to have inflicted their own damage on the expanded star, stripping it of much of its mass. The mystery of why Mercury's magnetic field is so weak may just have been solved: It is being stifled by the solar wind, researchers think. First high-resolution image of Mercury transmitted by the MESSENGER spacecraft (in false color, 11 narrow-band color filters).First high-resolution image of Mercury transmitted by the MESSENGER spacecraft (in false color, 11 narrow-band color filters).CREDIT: NASA/Johns Hopkins University Applied Physics Laboratory/Carnegie Institution of WashingtonView full size imageThe mystery of why Mercury's magnetic field is so weak may just have been solved: It is being stifled by the solar wind, researchers think.Mercury and Earth are the only rocky planets in the solar system to possess global magnetic fields, and for years scientists have puzzled over why Mercury's is so flimsy. Roiling molten iron cores generate magnetic fields, and given how extraordinarily iron-rich Mercury is for its size — its metallic heart may comprise two-thirds of Mercury's mass, twice the ratio for Earth, Venus or Mars — the innermost planet should have a magnetic field 30 times stronger than what spacecraft such as NASA's MESSENGER probe have detected so far.To study Mercury's magnetic field, researchers created 3-D computer simulations of the planet's interior and of the solar wind, the deluge of energetic particles from the sun that constantly bombards its nearest planet. The computer models suggested that the churning of Mercury's molten iron core ordinarily would amplify the magnetic field up to Earth-like levels, in a so-called dynamo process like the one within our planet. strange metal ball dropped out of the sky and slammed into the remote grassland of northern Namibia recently, according to press reports. The first Dutch astronaut to return to space, André Kuipers returned to the International Space Station this week on a mission the European Space Agency named "PromISSe." An ancient galaxy that formed just after the birth of the universe has been photographed by telescopes on Earth and in space, and is the brightest galaxy ever seen at such remote distances, astronomers say. Earth has two moons, a group of scientists . One is that waxing and waning nightlight we all know and love. The other is a tiny asteroid, no bigger than a Smart Car, making huge doughnuts around Earth for a while before it zips off into the distance and is replaced by another.